So this is the first real blog post of the series My Wishion for KDE where I will write about my presonal view, wish and vision for KDE. This time the following questions will guide us or me: Where are we now? What is KDE currently? But before I start – and below you’ll most probably find quite a long text – I’d like to include here a short summary that includes the most important thoughts and facts of the following wall of text. Though I highly recommend to not just read this summary but the whole article as there are many thoughts and ideas included (and even more not yet included) than the summary can handle. KDE is mostly about people. We are a huge project with an almost 20 years old history. We’ve great infrastructure and values (Manifesto) and our software is targeted towards end-users and normal people. But do we really succeed and achieve what we want? Are there problems and what are they? KDE makes software – that we probably all know – but let’s first concentrate on the people of KDE. 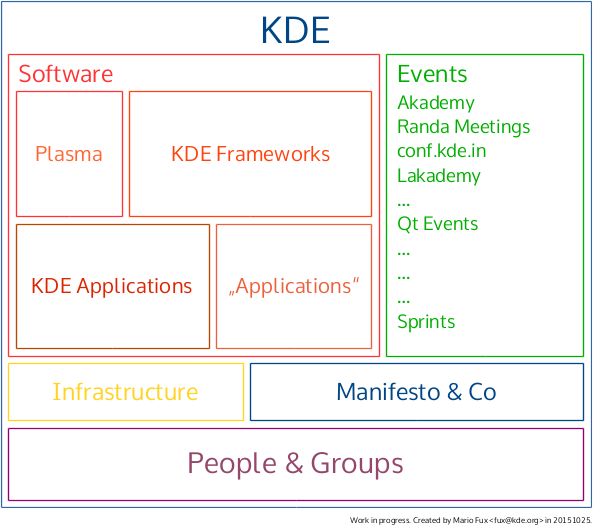 So KDE is the community and thus a rather big group of people (depicted as the foundation in the graphics below). Additionally we have several dozens of mailing lists which our besides the forums the most important internal communication channel. Another communication channel (Bugzilla on bugs.kde.org) which is currently the main channel to our users will get some more details in a moment. Userbase provides information for end users on how to use KDE applications. Community provides a place for sharing information within the community. 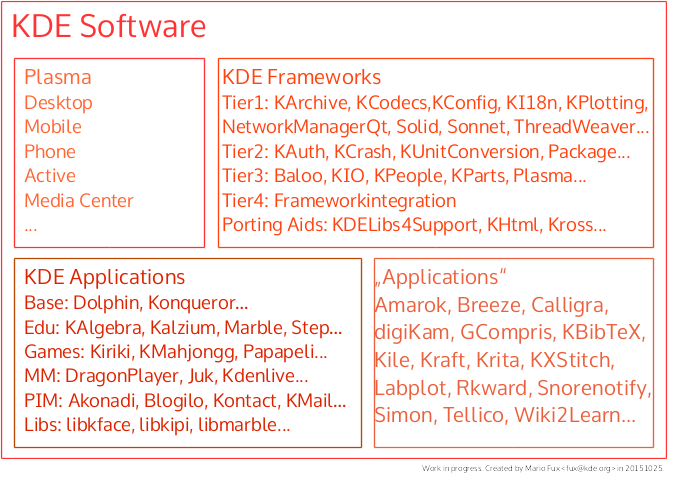 Techbase is for technical information about KDE software targeted at developers, ISVs and sysadmins. For the synchronous communication (if it’s not a live meeting, see next paragraph) we use IRC, Jabber, Hangout, Jitsi, Telegram and Co. So called real life (as if IRC and Co weren’t real life) or face-to-face events are depicted on the above graphics too. Akademy as the annual big KDE conference and community meeting and the Randa Meetings as the technical summit. Then there are the almost annual conf.kde.in – KDE conferences in India, Lakademy in Latin America and Akademy-fr and Akademy-es in France and Spain. And besides all this bigger events we see developer and contributor sprints that span from 2 to 4 days and from 2 to 20 people every other month. And all the communication happening via these channels, on these events and through these media is governed through rules, guidelines, netiquettes and guared by common sense in KDE and our own Community Working Group. 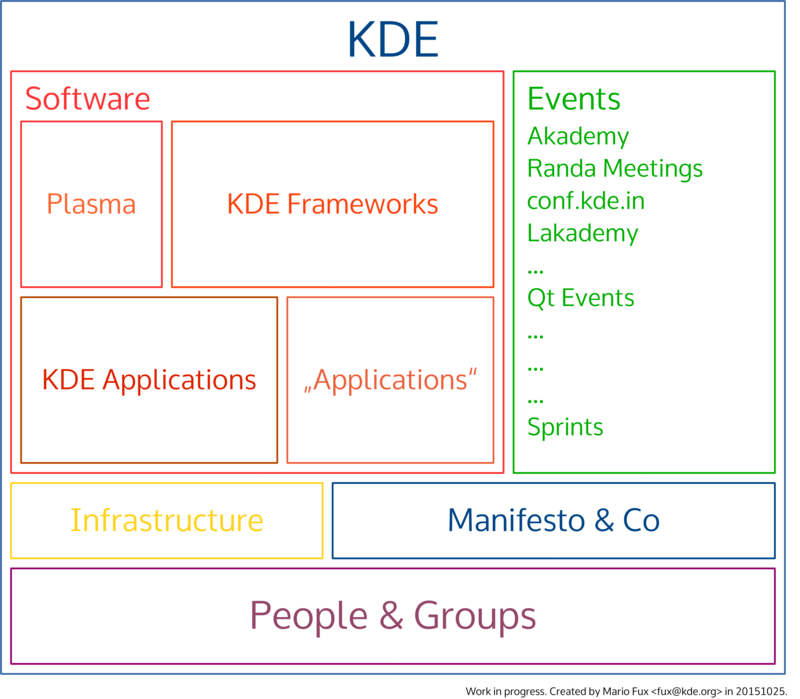 But probably the most important document we gave us is The KDE Manifesto which recordes our strong values like Free Software and End-User Focus and also defines the benefits and commitments of us and all our KDE projects. And thus we jump to the things that most people will connect with “KDE”: our software. Let’s zoom in to the software section of the overview picture above. You might already know that it covers topics like Personal Information Management, games, education and multimedia, general internet stuff (whatevery that means), financial, sports and food topics, workspaces, design and artists themes, Office work, photo management and much much more. All of them are released independently of the three big software collections we release in regular intervals. There are two other very successful pieces of software. One is Kdenlive – a free and open source video editor for GNU/Linux, Mac OS X and FreeBSD which is now part of the KDE Multimedia module which itself is part of the KDE Applications releases. The other is Plasma and probably currently mostly known for its desktop version and has its own release schedule. But before I finish this first article I’d like to take a look at the less good sides of the KDE things. Shed some lights on more difficult or to-be-improved parts. I don’t want to dig deeper into these problems and I don’t want to propose solutions here and now (but soon). But I want you to think about these things as well. Let’s take a look at a projects or community that once shared the office with us: Wikimedia Germany. There was even a time when our business manager worked half of the time for them. Today we don’t have a business manager anymore, the office is most of the time empty and Wikimedia occupies half a building in Berlin where they have several people working full-time on stuff for this great open knowledge and data projects. Another glimpse should be spend on our Sprint page. Just compare the number of sprints from recent years with this year… And then several people already talked, wrote and blogged about the decline of activity in our git repositories. So do we stagnate, decay or what is happening? This entry was posted on Monday, October 26th, 2015 at 22:54	and is filed under Uncategorized. You can follow any responses to this entry through the RSS 2.0 feed. You can leave a response, or trackback from your own site. 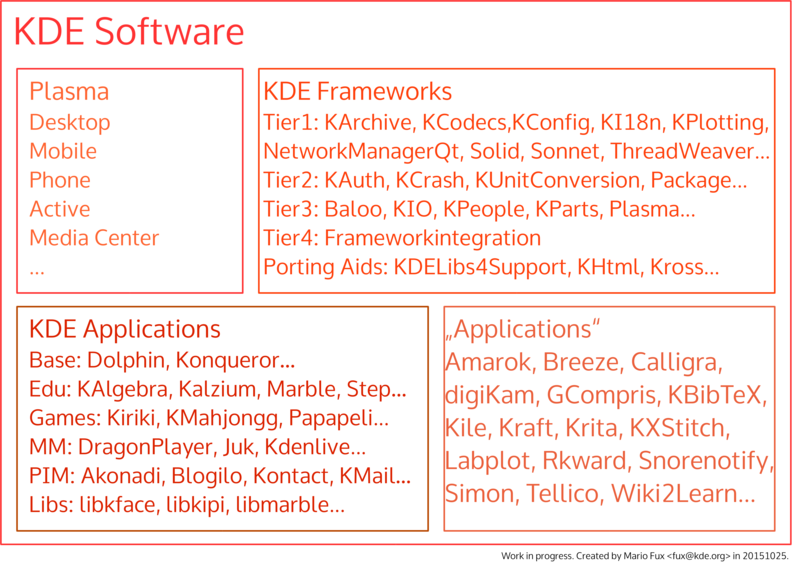 IMHO if we want to have KDE software widely used we should focus on the best applications we have and deprecate some others. I mean, we have very powerful applications like kdenlive, krita, digikam, kmymoney ecc. But we also have some others non so good like konqueror, kdisk, superkaramba ecc. Then we have dragonplayer, kmplayer, juk, amarok, kaffeine, kscd as a music player, we can’t mantain 6 music players, especially if there are already good Qt alternatives (like VLC for example). Consider focusing on a ristrect range of applications and improve porting of standalone KF5 apps on windows and mac (without plasma). I am fine with this. Hardware, like it gets produced today, get produced by slavery, over-exploration and so on. I prefer to use well tested second hand hardware. There are some companys, like afb24, how work together with companys, who roll out there hardware after some years, anyway, how well it still work. I write this, as an example, from a HP EliteBook 2740p, which cost me 167€, 33€ cheaper as with an included Windows 7 and get released by 1600 €, with one year warranty. There is a broker shop also available, which offers us the option, to buy a high amount of such devices, even cheaper, set a proper distro up and sell it. With profit. IMO that describes KDE software currently very well. And, again IMO, this shows why we still are not as successful as Wikimedia or Mozilla: those two are cross-platform, while our user base is small, desktop GNU/Linux has not taken off. Right now Linux is big (beside servers) on mobile (as Android) and in all kinds of embedded uses, both of which don’t have a traditional desktop. These games are the most popular games in the market and you can play these games online directly without facing any type of error or hurdle. These games are videos games and does not require any graphic cards to for the high resolution. I can’t state I had, however in case I do the KDE Plasma vision articulation, uncovered for the current week, flawlessly spreads out the task’s whats, whys and hows. That was really well explained. Thanks for sharing your views with us. Looking forward for your more interesting post. you can visit Yahoo Customer service if you need any kind of technical issue with your yahoo account.